Nine-months-old Tyler has discovered the power of the remote control. He seems to understand that there is a connection between pressing the remote control’s buttons and operating the TV. Sarah, now six months old, loves being in the bathtub. Lying on her back, supported by her mother, she studies the effect of her movements on the water. She particularly loves to kick her legs and is fascinated when she sees the water churning and splashing in all directions. Sarah and Tyler are beginning to understand the connection between cause and effect. They see that there is a connection between their actions and the world around them, and are beginning to realize that they can make interesting things happen. This connection is deeply established around the age of eighteen months, but babies have many earlier opportunities to examine it. Think, for example, of the following causal sequence: your hungry baby is crying bitterly. Suddenly, a breast or bottle arrives and provides him with the thing he most wants – milk. After many such moments – when he gives an involuntary signal and you respond – your baby will start to pay attention to the sequence of events. He will learn how to get you to do what he wants. Understanding the connection between cause and effect gives baby a greater understanding of her world. Understanding the connection between cause and effect gives baby a greater understanding of her world. It also increases her desire to explore, and to learn the logic that is the basis of the things she sees, hears and feels. An experiment conducted on six-month-old babies demonstrated their ability to grasp this connection: Two billiard balls were filmed for the experiment. One ball was tossed and collided with the other ball, causing the second ball to move due to the impact of the collision. This sequence of images was screened to the babies and they watched it repeatedly, until they became bored and stopped looking. Then, there was a change. The babies were shown the same two balls – only this time the first ball stopped some distance away from the second ball. Despite the fact that the first ball had never touched it, the second ball moved. The babies seemed surprised when they watched the new sequence of events, and appeared to understand that it was illogical. As the understanding of the connection between cause and effect deepens, baby becomes a true experimenter and investigator. She begins to examine the details of events carefully and anticipates the results even before they happen. Watch a seven or eight months old baby playing with a toy. She holds the toy, moves it, pulls it, tries to squash it, and does many other things to it so she can see what happens. If she gets obvious results from a toy she will try repeatedly to manipulate it, increasing her understanding of the connection between an action and its effect. This developing ability helps baby understand laws governing the various events she observes in her environment. This important intellectual achievement helps her plan her actions, allowing her to gain more control of her behavior. Understanding the connection between cause and effect gives baby a greater understanding of her world. It also increases her desire to explore, and to learn the logic that is the basis of the things she sees, hears and feels. Be consistent in your behavior with him. If you react differently each time he performs the same behavior, your baby will find it difficult to understand the logic behind your response. The clearer, more consistent, and more predictable his world is, the easier it will be for him to understand the connection between cause and effect . When he is about three months old, you will begin to notice that your baby is using his voice to call you. 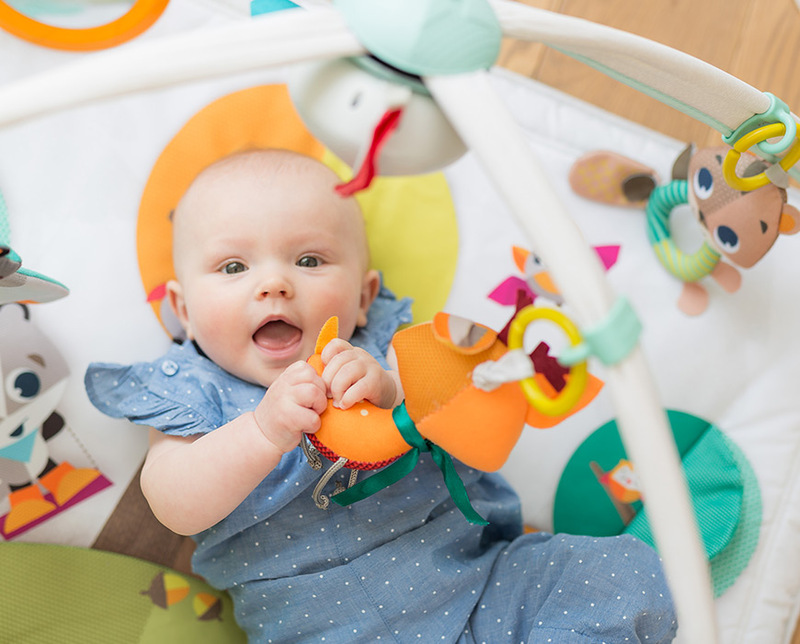 When your baby is around 3-4 months old, try laying her on her back in an activity gym with toys hanging overhead. 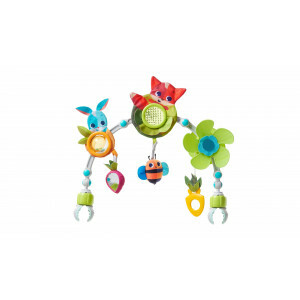 Her hand movements will gradually change - from random to deliberate and controlled - as she learns how to kick and shake the toys hanging over her. This will help establish the connection in her brain between what her body is doing and what she sees around her. 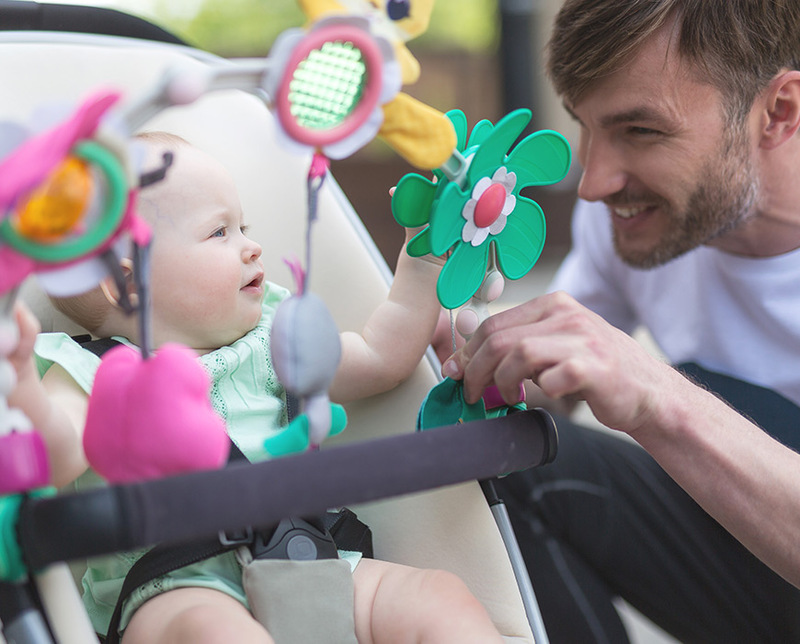 From the age of 6 months, your baby will be able to enjoy activity centers. Activity centers are toys with which your baby performs various activities and receives unambiguous feedback about his actions. For example, when your baby pulls a handle, a tune plays, when he manipulates fabric, a rustling sound is produced, and when he presses a button, a cute little figure pops up from a box. These unmistakable and interesting results will encourage baby to try again and again, deepening his understanding of cause and effect . At a slightly older age, around 8-9 months, your baby will be able to understand the connection between action and result even when there is a gap between the two events -- when the cause is in one place and the event in another. You will be able to create play situations for your baby where she can plan her actions. For example, place a cloth diaper within arm's reach and on the far corner from her place a toy (on the diaper). Encourage her to practice reaching for the toy. Gradually she will understand that if she pulls the diaper toward her she will be able to move the toy close enough to touch. Try to draw your baby's attention to all kinds of sequences of cause and effect . Explain the sequence to her in words. For example: "you’ve got a poopy diaper, so I'm changing you," "I've pulled the bath plug and now the water is disappearing". Make a habit of allowing your child to explore his environment so that he can see the results of his actions. Understanding the connection between cause and effect is an important achievement, a milestone in a baby's intellectual development. Imagine how difficult it was for your child to be in a situation of uncertainty, in a world in which things happen without rhyme or reason. In the past months, you have helped introduce logic into her life. She will gradually learn to make connections between things that happen, and will also begin to anticipate future events. This will make her world more understandable, more predictable, and more enjoyable.